The Amity Spartans Boys Hockey Team attended its annual Banquet on Wednesday, March 27. This event is an opportunity for the coaches and players to recognize their own for all the hard work they put in on the ice during the past season. The Spartans made it into the states, but, like the girls’ team (which won the SCC Title) they were eliminated after the first round. We’re proud of the 2018-19 Spartans for all of their accomplishments and tip a hat to Head Coach Mike “Scooter” Richetelli and the assistant coaches for a job well done. The following players were honored at the dinner. 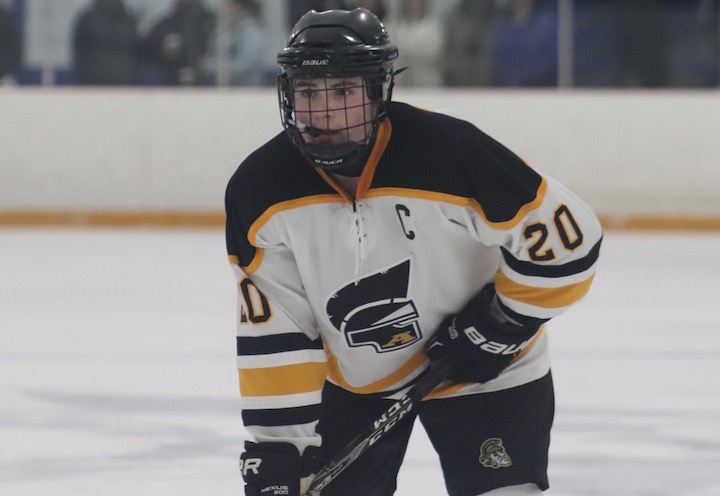 The 2018-19 Amity Spartans Boys Ice Hockey Team is already showing a lot of promise. 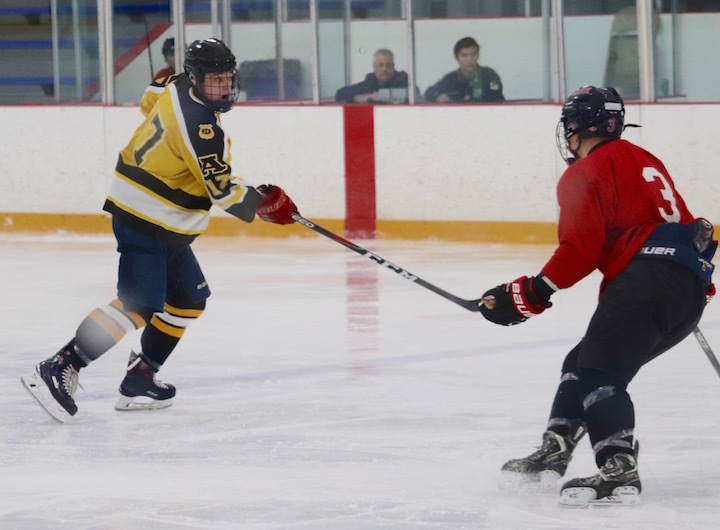 On Wednesday evening the boys declawed the Masuk Panthers 11-1 in a scrimmage game in West Haven. Tonight’s event will be much more telling, as the Spartans go up against three powerhouse teams in the Jackie Coyle Jamboree at Edward L. Bennett Rink at 6 p.m. West Haven, Notre Dame-West Haven, and NFI will give us an opportunity to see our boys in the most challenging experience on the ice so far. On Wednesday, we saw how skilled our goalies were and the exceptional teamwork of our Spartans. The 2018-19 team is not afraid to shoot, grab the puck from their opponents, and put themselves out there. If we see that same spirit tonight, going up against some of the toughest teams in the area. I believe in the Spartans, and even though the Jamboree only gives you a taste of things to come, I think you will see some impressive action out on the ice tonight. This season’s Amity Spartans includes some familiar names and a few new ones. Here is the 2018-19 Roster. The three Senior Captains are Colin Hughes (8), Jason Csejka (18), and Kenneth Page (20). There are seven juniors this season, Cody White (13), Connor Bath (14), Ed Martino (17), Michael Lebreck (19), Nick Kiwanis (22), Sai Neelam (29), and Malachi Zurolo (31). Head Coach is Mike Richetelli, who brought the 2014 Spartans to the state championship game. He’s assisted by Todd Dandelske, Jeff Buchter, and newcomer Jim Sokolske. The Amity Spartans Lacrosse team was on the road in West Haven Wednesday night for a match-up against the Blue Devils. Amity worked hard out on the field and outshot West Haven 27-18. Tyler Vincent and Colin Hughes made 3 goals each and Ryan Rattley and Mark DellaTorre each made 2 goals. Luke Smith had 3 assists, Mark DellaTorre had 2 assists, while Blake Batista, Matt Weidenfeller, Tyler Vincent and Ryan Rattley each had 1 assist. Goalie Matt Perrotti, a senior, really worked the net and made 10 saves. If you get an opportunity to watch this team play, keep your eye on #11 Capt. Corey Sachs. He is the “face-off king.” Very intense and one of the best I’ve seen in years. 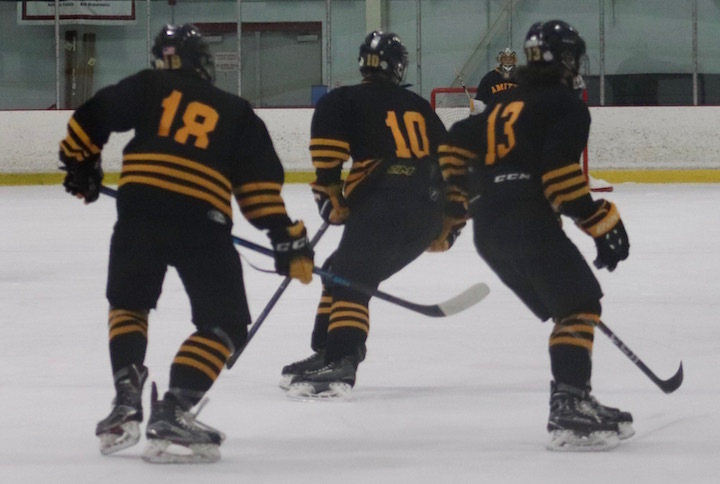 Boys Hockey: How Did Amity Do In The Season Opener? 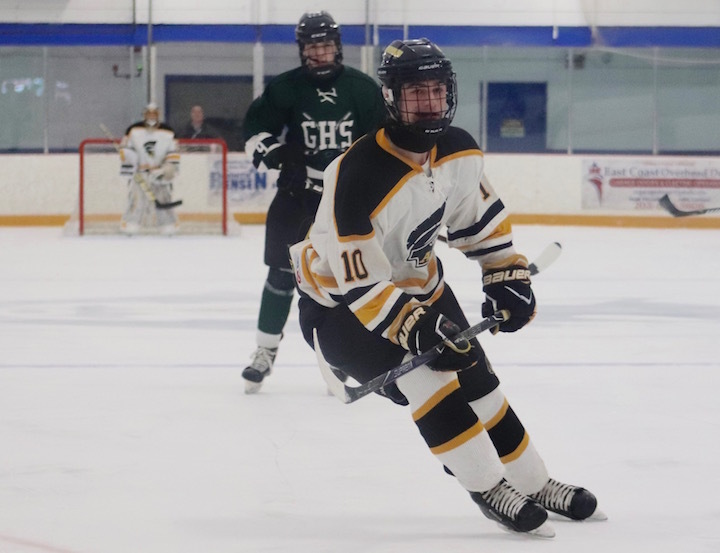 Amity High School, Around Town, Home, Latest News, School News, Sports Comments Off on Boys Hockey: How Did Amity Do In The Season Opener? The Amity Spartans Ice Hockey team was away at Northford for its season opener against North Haven on Sunday. During earlier scrimmage games, Orange Live noted that the 2016 team was faster and stronger than in past years, they showed those skills again in this game. Amity came out on top with a 1-0 win. Both goal tenders had about 30 shots on each. Senior Tyler Johnston got his first shut out of the season (he already had 2 in the first exhibition games). We look forward to seeing how far the mighty Spartans can go this year. Steve Conn submitted these photos from the game. Amity is wearing its black “away” uniforms. Goalie Tyler Johnston (31) deflects a shot.